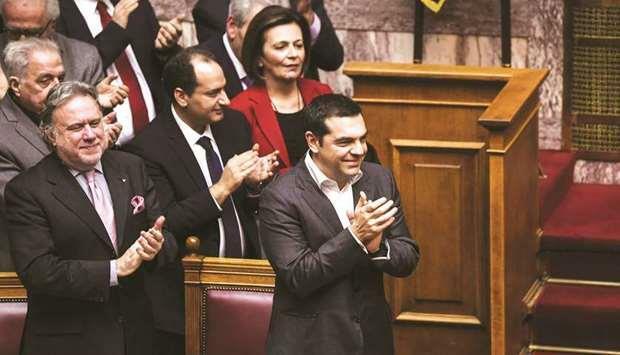 (MENAFN - Gulf Times) Prime Minister Alexis Tsipras has been implementing his re-election strategy to the letter over the past six months, steering Greece out of a humiliating bailout and resolving a decades-old dispute with neighbouring Macedonia. So far, it isn't paying off. He later caved in to the lenders' demands and has reinvented himself as a conformist. 'Our debt is huge and it's still growing, unemployment is still very high, said 30-year-old Athens resident Panagiotis, an environmentalist who works in the private sector. 'The crisis isn't over. That's a lie, we are not fools. Sources close to the prime minister say his strategy is only now reaching the point where his government can deliver on its pre-election promises and make amends for bailout pain — a plan he says aims at 'fair growth. Creditors released Greece from its third bailout in August, putting it back on the path to full financial independence. The government aims to shrink that gap before European Parliament elections in May, Tsipras' first official popularity test since winning power. 'We want to showcase that Greece has returned to normality, one of the government officials said. 'The aim is to shrink the gap in the EU election to be able to win a national vote later in the year. However, the deal appears to have won him respect from the European Union, Greece's major bailout creditor. It opens the way for the EU to start accession talks with the Balkan state and continue the bloc's expansion eastward. Tsipras' cabinet applauded him when he announced the minimum wage raise last week, but a meeting of eurozone deputy finance ministers gave it a cooler reaction a few days later. 'The atmosphere was not very positive, said a eurozone official. 'Greece is moving back in many areas. The general political feeling is of course positive about Tsipras and what he did about Macedonia, but this is not the markets, you cannot trade one thing for the other. One eurozone official said a late February progress report on Greek reforms 'did not look good. A negative EU report could unnerve markets — destabilising another plank of Tsipras' re-election strategy: the need for calm financial markets. 'There is a fine line that Greece needs to make sure it doesn't cross, said associate director at IHS Markit Economics Diego Iscaro.Markets understand it's a pre-election period but Athens needs to build a post-bailout reputation of reforms.